Of the eight projects recently approved for the first round of funding under the landmark new Green Climate Fund, not a single one came from the subnational level. Now, the Paris climate summit needs to recognize the efforts of cities. World leaders are currently meeting in Paris to engage in perhaps the most important negotiations ever to take place on climate change. And climate finance is one of the major themes featuring in speeches by heads of state and government — the need to scale up monetary support from developed to developing nations. Yet what also needs urgent attention is how exactly that increased support should be prioritized — and by whom. While city officials and other subnational authorities are arguably best-placed to assist in this decision-making process, thus far evidence shows they are ignored. This includes within the newest and potentially most significant of the international climate funds, the Green Climate Fund, aimed specifically at assisting developing countries deal with global warming. The need to mobilize USD 100 billion annually by 2020 has already been politically agreed. The challenge now is for developing nations to deliver it, enabling developing nations to come up with ways both to prevent new sources of carbon emissions and to adapt to the inevitable changes in climate. In reality, these financial needs are likely to be even greater. Recent estimates by IIED based on Least Developed Countries’ cost of climate-action plans (also known as INDCs) suggest they will need some USD 93.7 billion per year between 2020 and 2030 to execute these plans. Yet mobilizing this finance is not enough. It also has to reach vulnerable communities at the local level. To date, however, climate funds appear to be prioritizing large “business as usual” infrastructure projects rather than pro-poor climate-resilient local development. Energy access is a good example of this problem. In recent years, almost three-quarters of all international energy-related finance has continued to go to utility-scale energy projects, rather than to the decentralized energy solutions that typically bring more benefit to poor and vulnerable communities. The Green Climate Fund offers an opportunity to channel finance to the most climate vulnerable. Yet while its first suite of eight approved projects last month, worth some USD 168 million, does support a range of activities within developing and Least Developed Countries, only two of these initiatives are being funded through “direct access,” whereby developing countries possess full ownership over the use of the funds. The remaining six projects will continue through traditional financing routes, through multilateral or bilateral institutions. Further, while there is a clear need to balance traditional large-scale infrastructure projects with decentralized solutions, not one project from the subnational level was included on Green Climate Fund’s final shortlist. Indeed, the fund’s investment criteria appear to act as a disincentive for proposals from small subnational entities. Thirty-seven funding proposals were submitted in total, covering a wide range of projects and programmes. These included large-scale projects from the private sector (Acumen proposed a regional venture fund, for example) and proposals from multilateral bodies (the Inter-American Development Bank put forward a proposal for energy-efficiency bonds, in addition to several infrastructure proposals). More than 80 percent of the project proposals were located within Least Developed Countries, Small Island States or African nations. Further, proposals came from the international, regional and national levels — but none from the local level. In the Green Climate Fund, it appears, subnational entities once again remain on the decision-making fringe. Why are proposals from local entities missing? After all, several local funds, such as the County Adaptation Fund in Kenya and the Urban Poor Funds, have shown that involving local communities and local authorities can bring more equitable and sustainable outcomes at lower cost, closest to those most vulnerable to climate change. Yet past experience shows a clear gap between international funding and decentralized, bottom-up climate solutions. Today, there are several possible reasons why subnational entities are being left out of this important decision-making process. First is the simple bias toward track records. The selected projects show that the Green Climate Fund is prioritizing multilateral bodies and existing partnerships that have a record on such projects. Very few partnerships exist with subnational entities. There is also a capacity issue. On the one hand, subnational entities often have a much better understanding of their local financing needs. Yet on the other hand, they continue to lack the capacity, knowledge and experience to put together funding proposals. Although “readiness support”, designed to improve these capacities, is available from the Green Climate Fund, little such support has been disbursed thus far. Finally, as noted earlier, the Green Climate Fund’s current investment criteria are currently acting as a disincentive to proposals from the subnational level. The fund expects to finance proposals that are “bankable” and can assure backers of some level of economic efficiency. But local and community-based adaptation projects are perceived to fail to fulfil such investment criteria. There are at least three steps the Green Climate Fund could take to change this situation. First, it could accredit “inclusive” intermediaries. To ensure that local needs are prioritized, the fund could incentivize national intermediaries that have a track record of reaching out to communities and which prioritize social and climate-resilient development over growth. In many countries, for example, international and domestic development finance tends to flow to centralized government ministries, such as those responsible for infrastructure and energy. Yet such ministries often take a one-size-fits-all approach across the country, leaving marginalized communities and local authorities with little say over how the money is spent. Social development, local government, education and health ministries also have different roles to play in fostering resilience to climatic shocks among the poorest, and they often have strong relations with communities, civil society groups and local authorities. However, these institutions typically lack knowledge of and access to large-scale international climate finance. By addressing these gaps and channelling finance through these ministries and local departments, governments and donors can help ensure the poorest communities benefit. Strong potential examples already abound. In Bangladesh, the Infrastructure Development Company is a financial intermediary that invests in and represents the priorities of local people, for instance. And Kenya’s National Drought Management Authority likewise plays a crucial role in representing county-level interests in decision-making around national climate finance. Second, more needs to be done to develop subnational bodies as executing entities. Readiness support from the Green Climate Fund can help countries nurture local agencies to take on this role. And with such support, subnational entities could develop fundable proposals. Here, Kenya’s County Adaptation Fund has set a strong example, building capacity to empower devolved decision-making. This has encouraged project proposals that represent bottom-up interests, a model already being tested at the subnational level in other countries such Tanzania, Mali and Senegal through their ministries for local government. Third, the Green Climate Fund could prioritize social development alongside economic efficiency. The fund’s investment framework currently assesses project proposals based on qualitative explanations of how a project would perform under investment criteria. But the fund’s board could also consider ways to prioritize social development, particularly for local adaptation projects that are seen as less bankable. The Green Climate Fund has been a unique initiative for a number of reasons, including its direct access modality, country-driven approaches and equal focus on adaptation and mitigation. But there is today real concern that what made the fund stand out is already failing at the first hurdle by reverting to the standard financing practices of the other major climate funds, predominantly run by multinational development banks. Still, there is hope on the horizon, with the Green Climate Fund agreeing to pilot an approach that’s being called “enhanced direct access”. This would enable countries to take control of even more ownership of funds, with the idea of involving local banks and microfinance institutions as well as the ministries of local development. 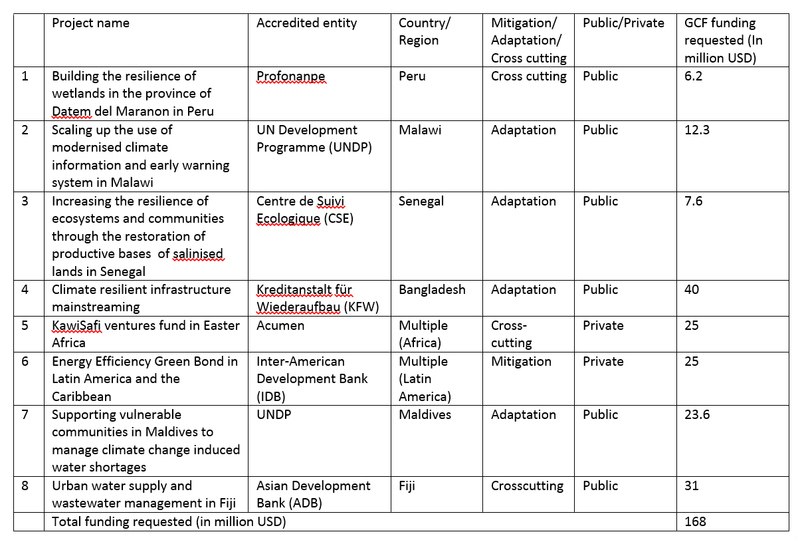 Importantly, these latter entities already have a ready-made institutional architecture to enable the flow of climate finance from the national to the local level, as well as planning processes that would enable community prioritization of funds. Although COP 21 doesn’t offer much scope on subnational-level discussions, there is opportunity here, and the current negotiating text does include language on promoting direct access. Further, decisions made in Paris around the future of major international climate funds need to emphasize enabling conditions for the direct access of finance at the local level. Indeed, a country-driven approach could allow for greater local-level penetration, by going beyond the national entities. Stay up to date on all COP 21 news on cities! Sign up here for Citiscope’s weekly newsletter. Marek Soanes is a freelance climate change and carbon consultant. Currently, Marek is working with the International Institute for Environment and Development on climate finance and carbon markets, ranging from the Green Climate Fund to analyzing finance for pro-poor energy access. Ced Hesse is a researcher with the International Institute for Environment and Development, in London. Ced’s experience is on the livelihoods of dryland areas, particularly pastoralism, and his work focuses on delivering devolved financial mechanisms to access and manage climate finance, enabling community prioritization of funds, resilience planning and developing systems for tracking the impacts of adaptation. He is currently working on mainstreaming climate adaptation into local government planning in Kenya, Mali, Senegal and Tanzania.